The behaviour of the human body and the representation of physical actions are central to the sculptures of Juliana Cerqueira Leite (b. 1981, Chicago, lives and works in New York). In Leite’s work, the body is both the subject and the “tool” that she uses to produce her sculptures. As the title indicates, the sculpture Object made by pulling apart a 70×70 cm solid cube of terracotta clay (2006) is the result of a series of physical actions. The pieces of clay, divided into four piles, carry the imprints of Leite’s hands. The sculpture is a product of both the strength and the limitations of her body. Leite’s oeuvre, which also consists of drawings, videos and photographs, deals with sculptural questions through the artistic use of the mobile – and unstable – body. Leite’s performance sculptures, which take the form of physical activities such as falling, rolling and climbing, articulate a new notion of physicality in art. Since the 1960s, female artists have been investigating themes such as identity, sexuality and gender through the use of their own bodies. In works like Up (2009) and Down (2009), Leite produces sculptural form through her performance. 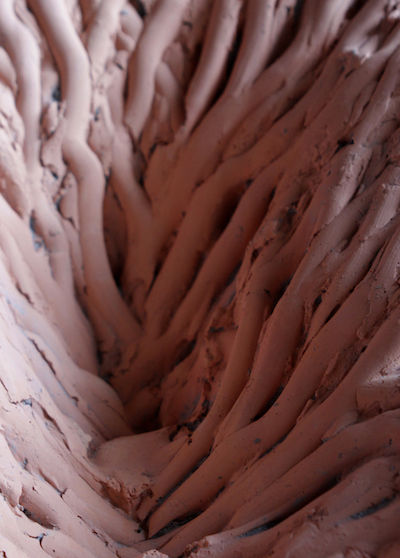 The works are plaster casts of the tunnel that the artist dug into two separate large pieces of clay (210 x 90 cm). The act of climbing up and down, moving intuitively within a small space, determines the appearance of the works. The hanging sculpture Down shows Leite’s footprints, toes, the round form of her elbows, the backs of her knees. The result is a document of a process that is completed and yet which clearly bears the traces of a living and fragile body within itself. Leite’s sculptures provide a new approach to figurative sculpture, and definitions of the self-portrait in particular. Blind Spot 2, 2015, installation view, Lustwarande 2015, commission of new monumental sculpture, De Oude Warande forest, Tilburg, Netherlands.